With this novel sodium press, suitable solvents can be dried easily and timesaving. The demand for dry solvents is growing in chemistry and pharmacy. At Grignard reactions, metallic hydride reactions and recrystallizations, these presses are a valuable help. Due to the hydraulic execution, the operation is child's play. 2.0 - 1.5 - 1.0 - 0.8 - 0.6 and 0.4 mm. Production of special nozzles according to customer specification. Large drying surface when using small nozzles. Production of lithium band without a heating system. By means of special adapters, analytical samples and test tablets can be produced. The press cylinder is made of stainless steel and can easily be cleaned. 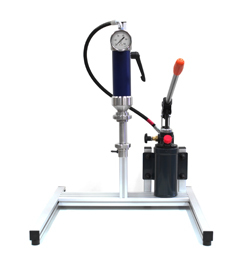 The sodium press is portable and easy to install.